Updated Tuesday April 23, 2019 by Grafton Little League. The parade is on Sunday April 28th. This season, we are excited to have more than 400 boys and girls will be playing in Grafton Little League. We hope everyone is excited about the start of another season of Little League baseball. Attached is the Schedule! 1.Volunteers Needed! Parents please volunteer to help during the parade. It takes many volunteers to successfully run opening day. Thank you to everyone that already signed up Here is the signup if you have not signed up yet https://www.signupgenius.com/go/409094FAAA72FA31-opening. The game schedule for the day is below. We will make sure everyone gets to watch their child play in their game if they are in the Coach Pitch or Tee Ball Division. For additional information about volunteering or with general parade and opening day questions, contact Parade Director Adam Rauktis at arauktis@whitinsvillewater.com. 2. All players should arrive to SGES (90 Main St., South Grafton MA) by 11:30 A.M. in uniform and look for their coaches. Players should wear comfortable sneakers for marching and not their baseball cleats. The players will line up by division Tee Ball, Single A, Double A, Bazinet (Triple A) and Dauphinais (Major Leagues). 3. Follow the signs at SGES for drop off in front of the school. Cars should move to the exit on the side of the school. The players will be lining up along the side of the school. Please drive cautiously and courteously as it will be very congested in the area of the school. 4. 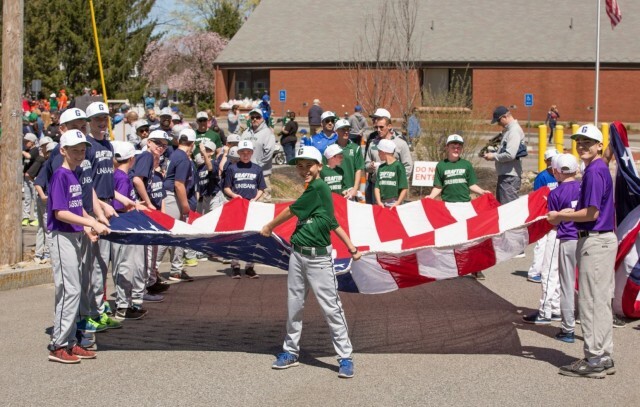 All players and coaches should have fun as this is a great day to celebrate Grafton Little League and baseball in general. Kid Pitch - Gatorade 12 oz. Baz - Gatorade 12 oz. Dauph - Gatorade 12 oz. 6. Once the players march to the Ferry Street complex the opening day ceremony will get underway. 7. At the conclusion of the opening ceremony, there will be plenty of food and drinks games and family activities for everyone. Thank you to Grafton Job Corp for their help and support on Parade Day. Children’s activities include a moon walk, speed pitch and pie eating contest. Reminder you need tickets for food and activities. Tickets are purchased at the Ferry St. Field. 8. The Tee Ball and Single A Division teams will all be playing a 1 inning game against another team. Games will be held a 1:20, 1:50 and 2:20 p.m. throughout the Ferry Street baseball complex. The schedule is below. 9. A baseball pitching skills competition will be held starting at 1:30 p.m. for all players in the Double A, Bazinet and Dauphinais Divisions. Prizes will be awarded to players in each division for the most accurate pitchers. 10. A silent auction will be held with many great pieces of sports memorabilia on hand with proceeds benefiting Grafton Little League.